eatmywords: Totally Chic or Totally Geek? Totally Chic or Totally Geek? I was flipping through a rather unremarkable magazine when I saw an image that caught my attention--it was a piece of fabric, but illuminated with all the colors of the rainbow. It was flat and flexible, but an obvious source of light that glowed in gorgeously vibrant hues. 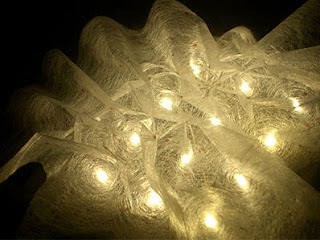 Immediately, I googled LED-embedded fabric and sought something similar to share with you. What I found was monochromatic, but perhaps more practical than a piece of fabric that is every color all at once. The all-white light is more elegant and chic, just like white-colored Christmas lights in comparison to the tacky multicolored ones. Would I want this in my house though? I'm not sure. 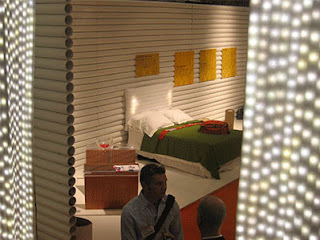 And would I want an LED-embedded headboard, like the one you can see through the LED-embedded curtains below? No thanks. I'd love to see how designers incorporate this into a room--next season of Top Design, anyone? Check here for more images and info.